The San Pedro River is a rare river indeed - it originates in Mexico and flows northward into the USA. Given its trajectory and that it rarely dries up it provides a corridor for many neotropical species of plants, animals, and insects to move into Arizona. it is a great draw for amateur naturalists and hikers alike, and the San Pedro National Riparian Conservation Area (SPNRCA) helps to preserve its future. San Pedro National Riparian Conservation Area (SPNRCA) is a hotbed for snakes, lizards, and birds. And to many people's surprise, it is an excellent location to observe unique dragonflies. The river itself provides excellent habitat for dragonflies that tend to like moving water, and there are spots where small ponds provide additional habitat for other species. I took a quick trip to the SPRNCA last weekend, and my casual observation noted 4 or 5 dragonfly species, most of which are difficult to photograph as they rarely if ever stop to perch. 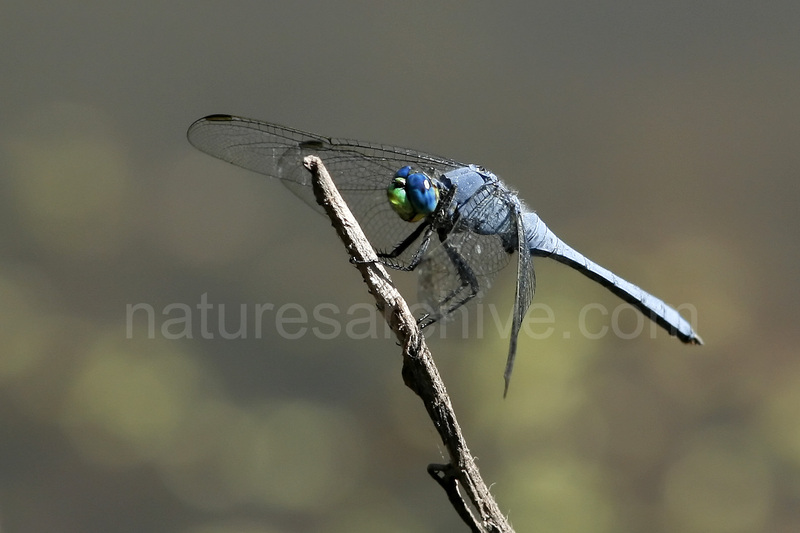 The Western Pondhawk (Erythemis collocata) is an exception in that it will perch for a few seconds now and again. The male Western Pondhawk is relatively easy to identify with its blue body, turquoise eyes, and green face. Females are also distinctive, though generally green in color. It is in the skimmer family, and is a rather large dragonfly. The males tend to patrol small lakes and ponds and perch low on sticks or even on the ground at times. The Western Pondhawk range extends from Mexico through the southwest USA, and up into the southern reaches of British Columbia. Note that while there is little overlap with the similar Eastern Pondhawk, there are a number of intermediate/hybrid pondhawks, even in Arizona. There is still some controversy over whethr these "intermediates" that show features of both Eastern and Western pondhawks are truly hybrids, a separate species, or just a normal variance.